Most movie fans first noticed Jake Gyllenhaal around the turn of the century. In actuality he’d been acting for nearly a decade at that point in a handful of movie and TV roles, but as is often the case, it’s the role he didn’t get that he remembers. Jake Gyllenhaal was nearly a Mighty Duck. "[M]y parents were like, ‘Look, you’re about to enter junior high school, you gotta get your education, that’s the most important thing. I promise you, you hate us now, but you’ll thank us later.’ And I do. 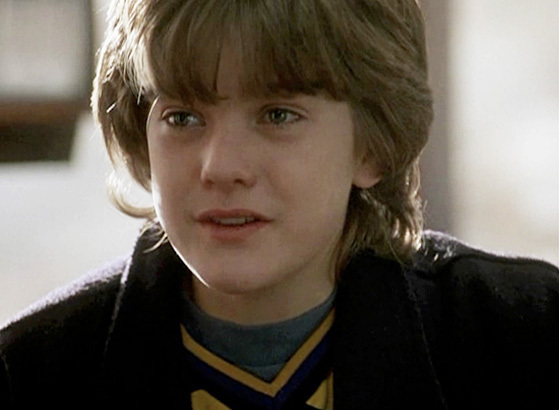 The part eventually went to a young Joshua Jackson, who reprised the role in two sequels. Isn’t he adorable? Gyllenhaal doesn’t mention if the fact that he missed out on three movies, rather than just one, made not taking the role even more painful. We imagine a teengage Jake Gyllenhaal giving his parents a withering glare when an ad for D2: The Mighty Ducks came on TV. He says he thanks his parents now. He doesn't say how long it took. Gyllenhaal would have to wait for his big break in 1999’s October Sky, followed by the cult hit Donnie Darko in 2001. Jackson became much more of a household name when he joined the cast of Dawson’s Creek on TV in 1998. Gyllenhaal has gone on to a stellar career, including Academy Award nominations. Jackson’s career has been solid, but he has yet to reach the level of stardom that Gyllenhaal has. Funny how things work out. So now we’ll try to imagine a young a Jake Gyllenhaal opposite Emilio Estevez decked out in a hockey jersey. While it probably wouldn’t have had a major impact on the film, we have a hard time imagining the guy from Nightcrawler as a pee-wee hockey player. Somehow the movie becomes creepier that way.